Sunday marks the beginning of what is called “Passion Week” or “Holy Week.” This is the final week leading up to Easter. In it, we walk with Jesus through the final week of his life. It helps us experience both death and resurrection in deeper ways. We hope you will join us each day this week as we head toward resurrection. We would like the story to end here. The crowd finally recognizing his majesty. 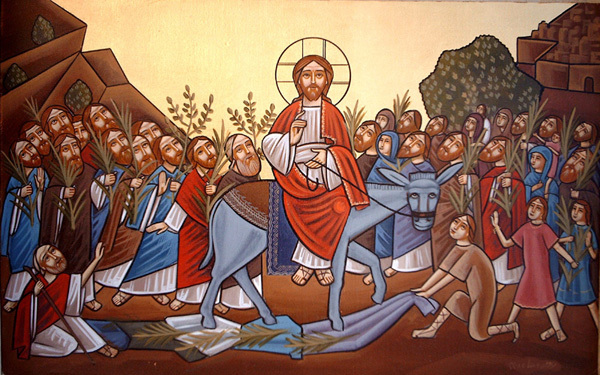 Spreading palm leaves and robes and shouting to the world their honor of this king. But this is not the last Sunday in the story. We have two Sundays. One with public approval and recognition. The other with a success going beyond the mere praise of people. If we stop here, the victory is not as complete. If we stop here, we have a successful Messiah. But when you compare that to a Risen Messiah, it pales in comparison. What kind of King do you want? A King who everyone likes? Or a King who can conquer death? If we stop here, it looks like everything may turn out ok. If we stop here, we sell ourselves short. But even if we sell ourselves short, if we stop here we avoid a lot of pain. The journey from this Sunday to the next is the most painful in all of human history. All other stories of tragedy and loss reflect this story. What lies ahead is painful goodbyes, extreme disappointment, public rejection, grotesque betrayal, inhumane torture, and a brutal death. If we stop here, no one needs to suffer, and our hero need not die. So we are forced to ask the question, Is it worth it? I was listening to Rob Bell’s talk at Mars Hill this week, and he said something that reframed some things for me. He was talking about suffering and pain and criticism. He called these things a refining process. When we suffer, hurt, are betrayed, rejected, critiqued, and ignored we are going through a refining process which makes us count the cost. I always assumed counting the cost was something you did up front. Before you make a decision, before you decide to change a lifestyle, you need to ask yourself – am I willing to do this? What is this going to cost me? And those are good things to think through. But can you ever really know what lies ahead on the journey? When I committed to my wife at our wedding, I was saying I would stay faithful no matter what. But is there any way I could have know how life would turn out? Is there any way I could know the ups and downs, the difficulty as well as the joy? Absolutely not. The real test comes when times get tough. And not just in marriage. This is how life works. When times get tough, when we suffer, when we are disappointed, betrayed, rejected, wounded, confused and tired we count the cost in new ways. We often hit a point of crisis. If I gave up this thing I am pursuing, if I just did things the way they have always been done, if I would just keep my head down, if I took the easier path, life would be so much better. I could avoid a lot of pain and hurt and difficulty. Am I willing to suffer for whatever it is I am pursuing? Am I willing to be misunderstood? Am I willing to give things up? Am I willing to not get my way? Am I willing to do things I deem as “below me?” Am I willing to take a few hits along the way? We count the cost. Because we suffer for the things that are worth it. Passion week reminds us that Jesus counted the cost. He decided there were some things worth choosing suffering over popular opinion. He chose the option of being rejected (in some of the most painful ways) over success, power, popularity, and status. Because it was worth it. To put a finer point on it, YOU were worth it. This week asks us to count the cost. What are you willing to suffering for? What are the things you are willing to give up success and status for? Because chances are, these are the things that really matter. These are the things we need to pursue. And when we do, we may just discover, these are the things that lead us to Resurrection. This entry was posted in Lent and tagged Counting Costs, Difficulty, Lent, Palm Sunday, Suffering, Triumphal Entry. Bookmark the permalink.